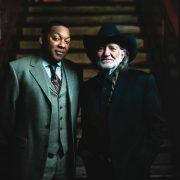 The initial eyebrow-raising that greeted the announcement of Wynton Marsalis and Willie Nelson’s 2007 live collaboration quickly gave way to a forehead-slapping “Of course! Why didn’t I think of that?” Jazz and country, despite their obvious differences, share a root in the blues, one that’s been explored many times since Satchmo blew alongside Jimmie “The Singing Brakeman” Rodgers on a take of “Blue Yodel #9” back in 1930, and the two nights Marsalis and Nelson spent together at Jazz at Lincoln Center’s Allen Room in retrospect seem natural. Both musicians owe an incalculable debt to the rudiments of the blues, and the hunch that their pairing would work resulted in one of last year’s surprise hit albums, Two Men With the Blues. The inevitable DVD followup reprises all of the album’s 10 tracks, adds three more (“Don’t Get Around Much Anymore,” “Sweet Georgia Brown” and a rousing finale of “Down by the Riverside”), and jumbles the sequence for reasons unstated. The visuals confirm what the audio already made clear: Wynton Marsalis probably never had this much fun onstage before, and Willie Nelson is, well, what Willie Nelson always is. For once Marsalis isn’t so much concerned about preserving the legacy of jazz as he is with just digging the party-and when Willie Nelson is at your party, it’s going to be one to remember. Interspersed with backstage interview footage-the two mainstays praising one another, elucidating the commonalities of their chosen genres, etc. (not surprisingly, Marsalis does more actual elucidating than Nelson)-the hour-and-a-quarter program stays lively and engaging. Unfortunately, too often it’s too lively: Director Danny Clinch is edit-obsessed throughout, zipping from player to player so feverishly that almost no musician gets more than a few seconds of screen time during any given segment, even when soloing. And the copious intercutting of traffic footage of Manhattan is also wholly unnecessary-we get it, the gig, laidback though it was, was in New York; how many times must we see speeded-up buses to grasp that? Headache-inducing visual style aside, however, Live From Jazz at Lincoln Center, NYC is a welcomed document of a welcomed event.